ANOTHER NEW SIDE OF SOFT MACHINE. You never cannot get bored easily with SOFT MACHINE! There is always something new happening. After the good, but average SEVEN , the band will come back with quite a few surprises, and good ones at that. Not that any regular members left, but a new one has been added, one that will drastically -again-change the sound of SOFT MACHINE. His name is ALLAN HOLDSWORTH - who is gonna make a big name out of himself later on- and he plays ...guitar!! The guitar, this is not a word assimilated with the SOFT MACHINE name in the same sentence usually! Last time i checked, HUGH HOPPER played some acoustic on VOLUME 2 on his track DEDICATED TO YOU BUT YOU WEREN'T LISTENING, and that was nothing lead. Not only there is a guitarist, but the band gives him the main stage to shine throughout the whole recording; Yes, BUNDLES is a guitar driven album where the other musicians instruments take more or less a backseat behind the guitar profusion of ALLAN HOLDSWORTH. Not only we can hear memorable scorching guitar bravado, but there are also some delicate acoustic passages quieting the mood of this album. Another big change we can notice is that this album is not ''numbered'' as usually and don't carry the name ''EIGHT'' as one would have expected! Now we have BUNDLES showing clearly who the new boss in town is. KARL JENKINS now has almost complete artistic control of the band as more and more the lone original member is relegated in the background bringing to the table only 2 short pieces THE MAN WHO WAVED AT TRAINS and PEFF. Of course, JOHN MARSHALL is back with his customary percussions solo track named FOUR GONG AND TWO DRUMS. I always wondered many times why MIKE RATLEDGE who was the main architect of the SOFT MACHINE sound and its main composer pratically gave up artistic power to a rather recent newcomer KARL JENKINS before actually leaving the band for good. Not only RATLEDGE would leave the band but also witdrew from the music scene completely, never to be heard again (until a percussion programing !!! !20 years later on the ADIEMUS project....with KARL JENKINS!). This is a unique case in the whole world of prog. I can only guess the passion and drive for creating music and touring took a toll and left him for good.He never has released a solo album or been part of any musical reunions or one-time musical events. Never! MIKE RATLEDGE has left the music building very discreetly without fanfare with no return address!! 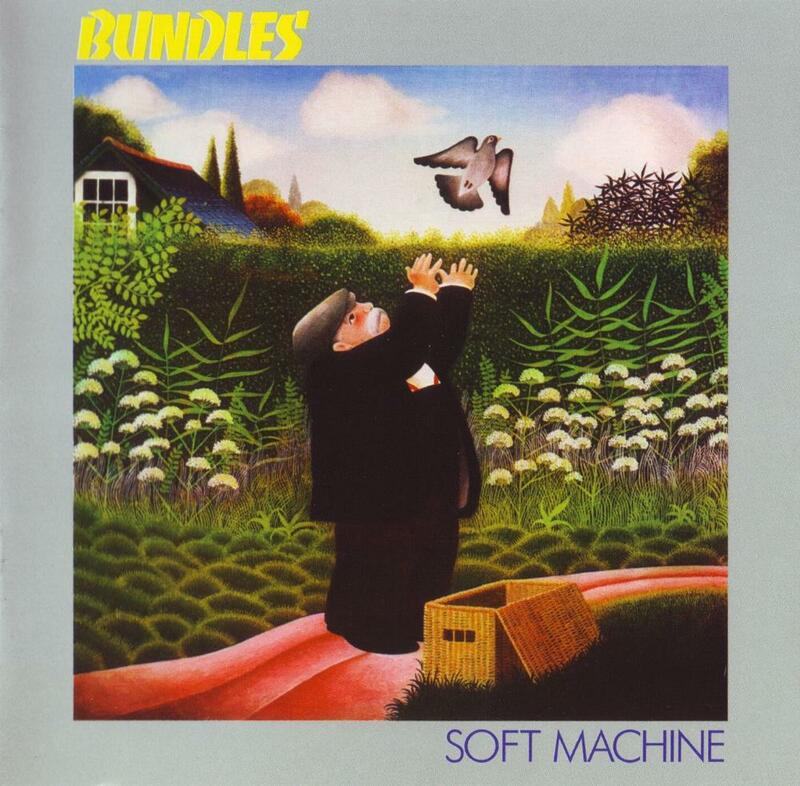 BUNDLES is a typical jazz/rock fusion album well in the spirit of the time-1975- not trying any new ground as SOFT MACHINE used to in the past. But that's a very refreshing album, thanks to the guitar of ALLAN HODSWORTH who is having a lot of fun, especially on the ex-side 1 which featureS the fantastic suite HAZARD PROFILE , a suite in 5 movements alternating strong rock rythms where HOLDSWORTH shines furiously and more mellower passages with beautiful gentle piano playing. HAZARD PROFILE is the jewel of the album which showcase the great compositional qualities of KARL JENKINS. As good as the best other great fusion bands would come up with back then. This is a new SOFT MACHINE, a new sound ,a band that could be aggressive now ''rocking'' and could be at the same time a very introspective and delicate band with beautiful tracks such as the wonderful ambient THE FLOATING WORLD and its haunting flute playing or some of the quiet parts of the suite. Some old fans complained that SOFT MACHINE was merely following now the path opened by other Jazz/rock giants not creating anything new like the ''old good'' SOFT MACHINE that was not shy to experiment. I am not one of those as i think the band needed new blood and a refreshened sound as the band became to static artistically.And the best has yet to come!!! !